The Pivithuru Hela Urumaya (PHU) headed by MP Udaya Gammanpila today said the law enforcement authorities should take immediate action over the controversial statement made by former State Minister of Child Affairs Vijayakala Maheswaran, before she leaves the country. 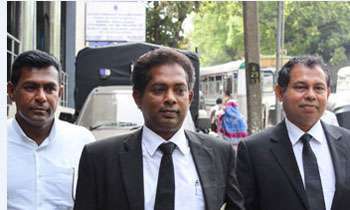 PHU Propaganda Secretary Thushara Dissanayake said they have received reports that MP Maheswaran was planning to leave the country. "We request authorities to take immediate action, because if she goes abroad, it would obstruct investigations," he said. Meanwhile, Mr. Dissanayake said the United National Party (UNP) should cancel the membership of MP Maheswaran.